In Osaka, where audience interaction is far from guaranteed, the entire crowd shouts it with him. That, bassist Jonas Björler thought at the time, had never happened before. Slaughter Of The Soul is now firmly established as one of the most influential metal albums released during the 90s. The so-called ‘Gothenburg sound’ has become such a ubiquitous part of modern metal’s sonic vocabulary that few would dispute At The Gates’ status as pioneers. Death metal hits? Yeah, we’ll drink to that! Back in the early 90s, however, the Swedes were simply one of many aspiring underground death metal bands exhibiting a cheerful disinterest in mass appeal. When the band recorded their debut EP, Gardens Of Grief, they had only been playing their instruments for a year or so, and while grimy early albums such as 1993’s With Fear I Kiss The Burning Darkness will always have their advocates, they offered scant evidence that the band were about to morph into an epoch-shattering, cutting- edge machine. That all changed after the departure of original guitarist Alf Svensson in ’93, and the passing of the songwriting mantle to the band’s other six-stringer, Anders Björler, Jonas’s twin brother, for third album Terminal Spirit Disease. Recorded early in 1995 at Studio Fredman in Gothenburg, and overseen by noted producer Fredrik Nordström, Slaughter Of The Soul was At The Gates’ first album for new labelmasters Earache Records, home to many of the Swedes’ own favourite bands, including Morbid Angel and Carcass. Signing to Earache was undoubtedly a commercial step up for Jonas and his bandmates, but they felt no pressure to make a particular type of metal album. The one member of ATG that didn’t have the easiest time during the recording process was drummer Adrian Erlandsson. Given its reputation today, you would be forgiven for assuming that Slaughter Of The Soul was an instant success upon its release in November 1995. However, despite glowing reviews in the metal press and the enhanced profile partially provided by the move to Earache, the metal world of the mid-90s was not quite ready to proclaim the album an era-defining masterpiece. Worse, the band were about to fall apart before they’d even achieved lift-off. As a result of their untimely split, At The Gates were conspicuous by their absence as Slaughter Of The Soul began to steadily exert its allure on the burgeoning 21st century metal scene, particularly in the US where bands such as Killswitch Engage, Trivium and The Black Dahlia Murder made no bones about their love of the album and their debt to its game-changing sound. This new generation of metal kids got their chance to see what all the fuss about when At The Gates reformed in 2008. Initially, it was supposed to be just for one summer tour. More than decade on from returning to action, Jonas and his bandmates have more than made up for lost time. Since reuniting, they’ve made two albums, 2014’s At War With Reality and 2018’s To Drink From The Night Itself, the melo-death masters are proud but ever-so-slightly bemused about their impact on the metal world. 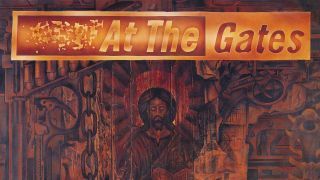 It’s left to Matt Heafy, ever the student of heavy music’s nuts and bolts, to explain how and why At The Gates broke the mould on Slaughter Of The Soul.